Fall Color: Brilliant red / orange / yellow. Comments: Sugar Maples are excellent shade trees that produce spectacular fall color. However, they are sensitive to heat, drought, and pollution. 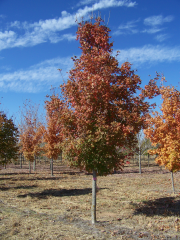 These maples require rich, well-drained soils, and respond poorly to soil compaction and salt. Fortunately for Oklahoma, a subspecies (believed to be an ecotype) of the Sugar Maple was discovered in the southwest part of the state that is specifically adapted to our hot summers and drying winds. This maple was named after its county of origin, the 'Caddo' Maple. It is unique in that it can tolerate what other Maples cannot. However, unlike most trees, the Caddo Maple will respond negatively when overly maintained or irrigated.